1. Eliminates 9,306.5 education positions -- 5,184.5 teachers, 3,850 teacher assistants, and 272 Support Personnel (guidance counselors, psychologist, etc.). 2. Provides NO pay increases for educators, continuing North Carolina's race to the bottom of national salaries. In 2007-08 North Carolina was ranked 25th in the nation in teacher pay, last year our state was 46th. With no additional pay, next year North Carolina undoubtedly will be at the bottom. 3. While gutting public schools and educators, the legislature adopted a $50 million school voucher program ($10 million 2013-14, $40 million in 2014-15). 4. The North Carolina Budget eliminates career status for all teachers. Senate legislation, that received no public hearings in the House, was placed in the budget to eliminate career status for teachers. The new standard requires each school district to identify the top 25% of effective teachers without providing any criteria on how to accomplish this ranking of professionals. Teachers will be placed on a 1, 2, or 4 year contract. The top 25% will be given the option of receiving $500 to compensate them for the loss of due process rights. NOTE: the new system will be phased in over the course of the next five years. 6. Grades Schools (A-F), 80% based on standardized test scores, 20% based on growth. No other variables will be considered in this grading. 7. Eliminates the Teaching Fellows Program, once heralded as a national model for recruiting teachers into the classroom, the program is no longer funded. • Cuts Limited English Proficiency funding by $6 million dollars. 9. Retired educators will receive NO Cost of Living Adjustments (COLA). 10. The General Assembly will be back next year. So the following is from the NCAE Website. It can be found here. Please, advocate for our teachers, ours schools, and ultimately, our children. 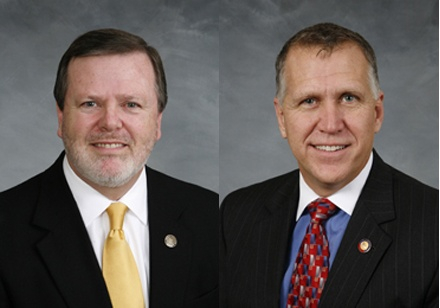 Senate President Pro Tem Phil Berger (R-Rockingham) and Speaker Thom Tillis (R-Mecklenburg) put the final touches on a General Assembly budget this past weekend, including the trading of of vouchers (Tillis' demand) for stripping teacher tenure (Berger's demand). The bill will be voted on Tuesday and Wednesday by both chambers and it cannot be amended once it is on the chamber floors. NCAE is calling for a NO vote on the budget by legislators. More news to come from NCAE President Rodney Ellis with full analysis later in the day. and ask both your Senator and House member to vote NO on the budget. Start the calls at 9 am and call multiple times and spread the word to your colleagues to do the same. NCAE reminds you to be respectful and professional. Also remember that this was a back room deal between the General Assembly leaders and many Republican legislators are dismayed by this turn of events, especially in the NC House where a bipartisan tenure reform bill passed with only one dissenting vote. Remind your legislators that the Senate tenure plan has never gotten a floor debate in either chamber. The Senate tenure plan has never been vetted in a House committee. Vouchers have never been vetted by a Senate committee. This is not only bad policy, it's bad process. Here are the budget documents if you care to review. NCAE is working on an analysis and will have another DPB in the afternoon. New - Committee Report - The Joint Conference Committee Report on the Continuation, Expansion and Capital Budgets, for Senate Bill 402, 7/21/2013.